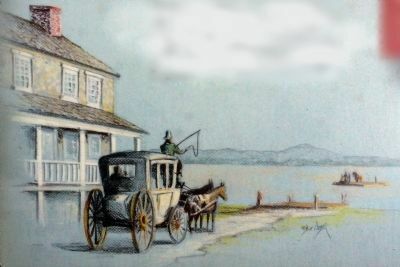 The taverns and the ferry made Havre de Grace, originally called Susquehanna Lower Ferry, a successful town in the early 19th century. People arrived via the Post Road, the major route of north/south travel in the day, and crossed the Susquehanna River on one of the ferries. "By several passengers in the stage, which arrived last evening, information is received that about the dawn of day yesterday morning, a considerable number of the enemy came up as high as Havre-de-Grace and commenced the bombardment of that place with shot, shells and rockets." Taverns provided food, drink, and lodging for travelers as they waited for river conditions to allow passage. Mrs. Sears' Tavern stood near this location and Mr. Mansfield's Tavern was just north. 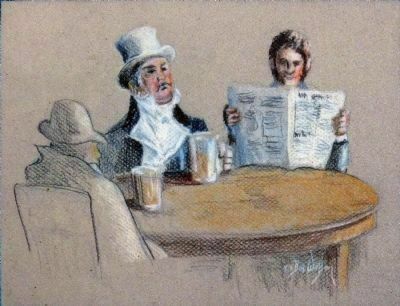 News traveled into town with the passengers on the Post Road, and locals would frequent the taverns to hear the latest happenings in Baltimore and Philadelphia. 2. Susquehanna Lower Ferry Marker on right with Susquehanna River beyond. 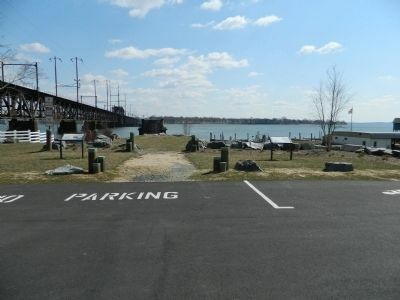 N, 76° 5.457′ W. Marker is in Havre de Grace, Maryland, in Harford County. Marker is on N. Union Avenue. Touch for map. 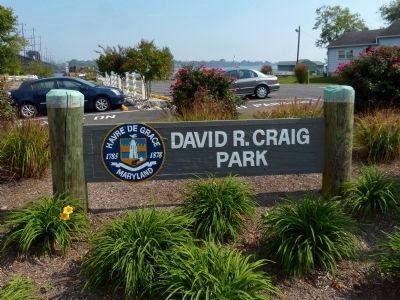 Marker is in David Craig Park south of the Railroad Bridge. Marker is in this post office area: Havre de Grace MD 21078, United States of America. Touch for directions. Other nearby markers. At least 8 other markers are within walking distance of this marker. Under Attack (a few steps from this marker); Susquehanna River Crossing (within shouting distance of this marker); Old Post Road: Susquehanna Lower Ferry (about 300 feet away, measured in a direct line); Matilda O'Neill Home (about 500 feet away); Out of the Flames (approx. 0.2 miles away); Rochambeau Plaza (approx. 0.2 miles away); War in the Chesapeake (approx. ¼ mile away); "O! say can you see..." (approx. ¼ mile away). Touch for a list and map of all markers in Havre de Grace. This park is named for the County Executive of Harford County. More. 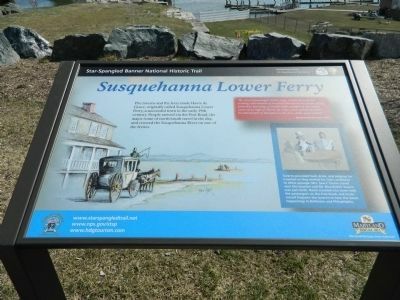 Search the internet for Susquehanna Lower Ferry. Credits. This page was last revised on June 16, 2016. This page originally submitted on April 4, 2013, by Bill Pfingsten of Bel Air, Maryland. This page has been viewed 658 times since then and 33 times this year. Photos: 1, 2. submitted on April 4, 2013, by Bill Pfingsten of Bel Air, Maryland. 3, 4, 5. submitted on October 10, 2013, by Allen C. Browne of Silver Spring, Maryland.